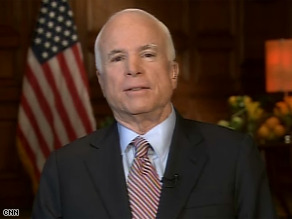 Does McCain really oppose financial regulation?. An Obama-Biden administration would "increase regulatory oversight of the very people John (McCain) has refused to regulate," Democratic vice-presidential candidate Sen. Joe Biden said Tuesday, Sept. 16, on CNN's "American Morning." Until recently, Republican presidential nominee Sen. John McCain consistently described himself as an opponent of most government regulation. In 1995 McCain proposed an across-the-board moratorium on all federal regulations, but that failed in Congress. In March 2008 he said in an interview with the Wall Street Journal, "I'm always for less regulation. But I am aware of the view that there is a need for government oversight. I think we found this in the subprime lending crisis - that there are people that game the system and if not outright broke the law, they certainly engaged in unethical conduct which made this problem worse. So I do believe that there is role for oversight. "As far as a need for additional regulations are concerned, I think that depends on the legislative agenda and what the Congress does to some degree, but I am fundamentally a deregulator." As his campaign has developed and situation on Wall Street has worsened, McCain gradually has added increasing regulation of the financial sector to his reform themes but has provided few specifics. Speaking in Jacksonville, Florida, on Monday, Sept. 15, McCain said that a top priority of his administration would be to "replace the outdated patchwork quilt of regulatory oversight and bring transparency and accountability to Wall Street" but he offered no details. In his own appearance on "American Morning" Tuesday, Sept. 16, McCain said that some regulatory agencies had been "asleep at the wheel for the last couple of years or a few years," and "those agencies have to be consolidated, and they have to be given more strength where necessary." He did not identify any agencies by name or offer any specifics.